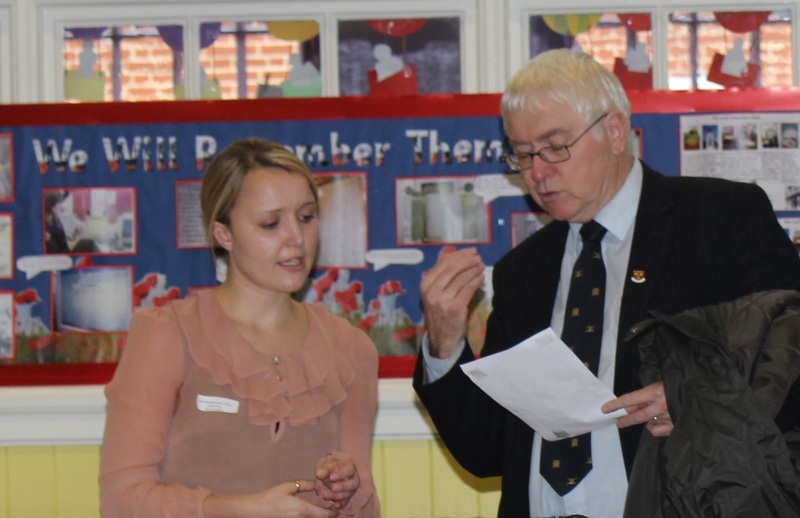 This guest post is written by Laura Davison, project officer for We Will Remember Them. This HLF-funded school project has used documents stored at ERO and included a visit to ERO for the pupils involved. 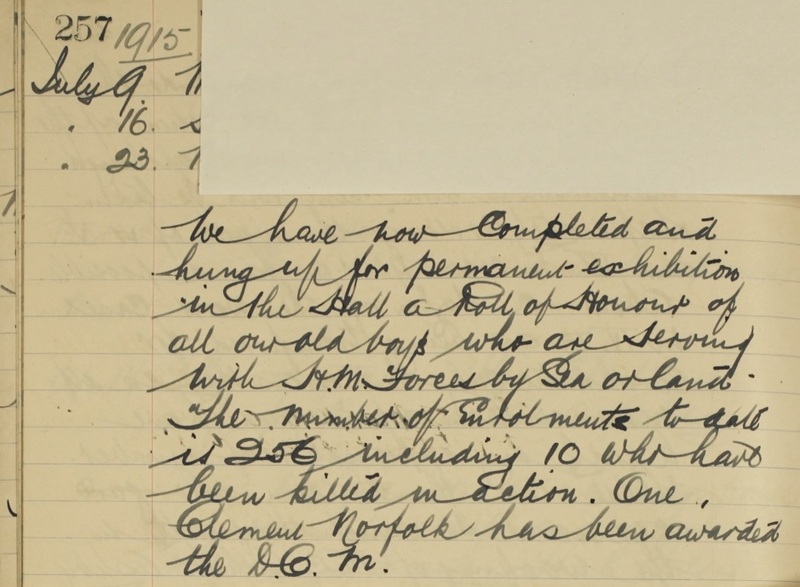 Year 5 pupils at North Primary School in Colchester are working on the year-long project We Will Remember Them, researching the lives of the 50 former pupils who volunteered or were conscripted for action in the First World War. This innovative project explores how the discovery of locally relevant histories can engage and inspire pupils in responding to moments in the history of the First Word War. 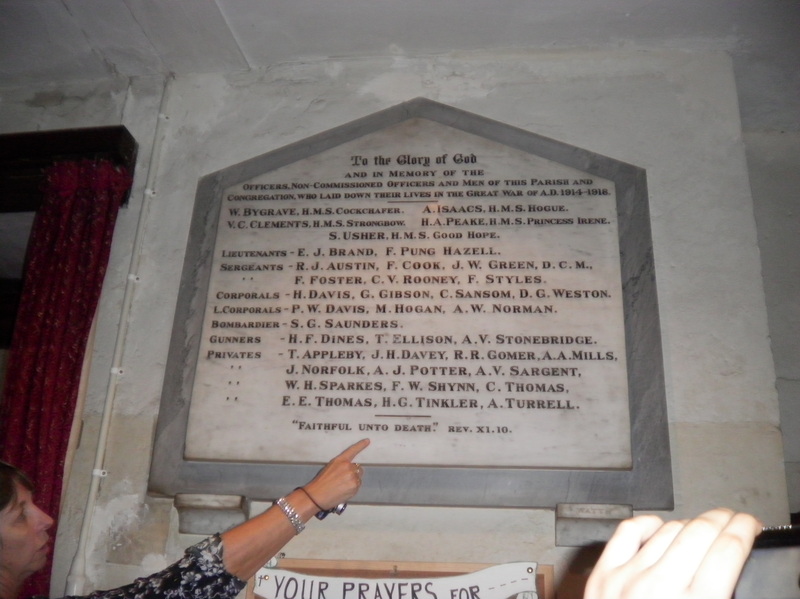 The whereabouts of the Roll of Honour, installed in the school hall in 1915, is unknown. The funding from the Heritage Lottery Fund for We Will Remember Them will enable the school re-instate the Roll of Honour, restoring this object of heritage to its original setting within the school’s Grade II listed building. This will be supported by a showcase exhibition, publication and teachers’ pack narrating the untold stories of the former pupils’ lives and how they were affected by the First World War. This history project captures all our past, present and future. The children are often told that our school is more than just a magnificent building – it is the stories of all its former pupils and staff. 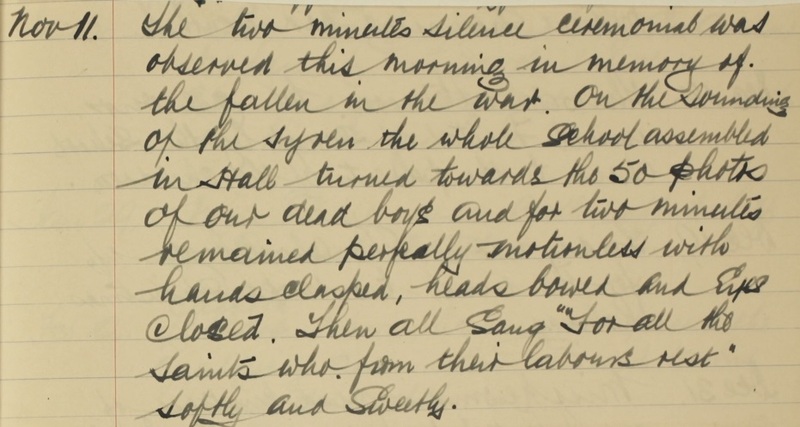 To work with a local historian to uncover the stories of those who lost their lives in that terrible war will bring national and local history alive to our pupils. And to have our Roll Of Honour re-made and restored to its rightful place in our school hall, well that will be a proud moment indeed. The Year 5 pupils have worked with Historian Claire Driver to research and record the former pupils. All the hard work has paid off, as they have identified sixty-two pupils who served and died in the First World War. Each pupil is paired with a former pupil to develop individual case study. Claire has shown them how to use archive records from the School Log Book, the 1901 and 1911 census and military records. Using the 1897 map of Colchester, they have plotted where all the former pupils lived and identified what shops were in Colchester High Street in 1914. Gradually a picture is being formed of what it was like to live in Colchester 100 years ago. 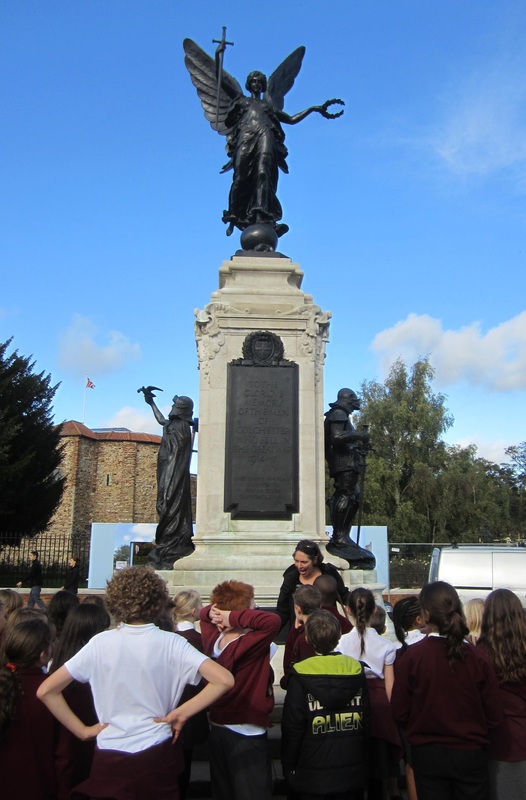 The children have been on an amazing journey building up an understanding of the social context of the school to promote awareness of their lives in the context of the First World War and the impact it had on the school and its locality. 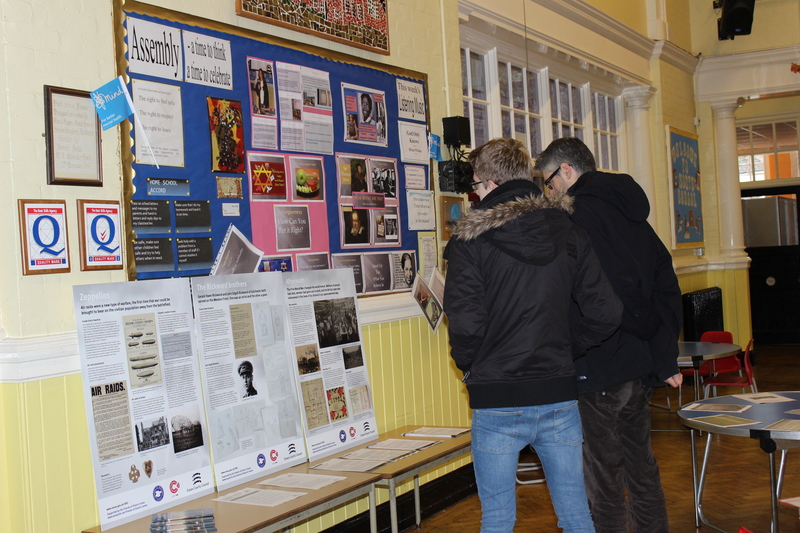 An Open Day was held at the school, inviting local residents and families to get involved with the project and share their family stories and memories from the First World War passed down through generations. Recently, the pupils visited Essex Record Office to view the collections and discover how historians use archives to support their research. 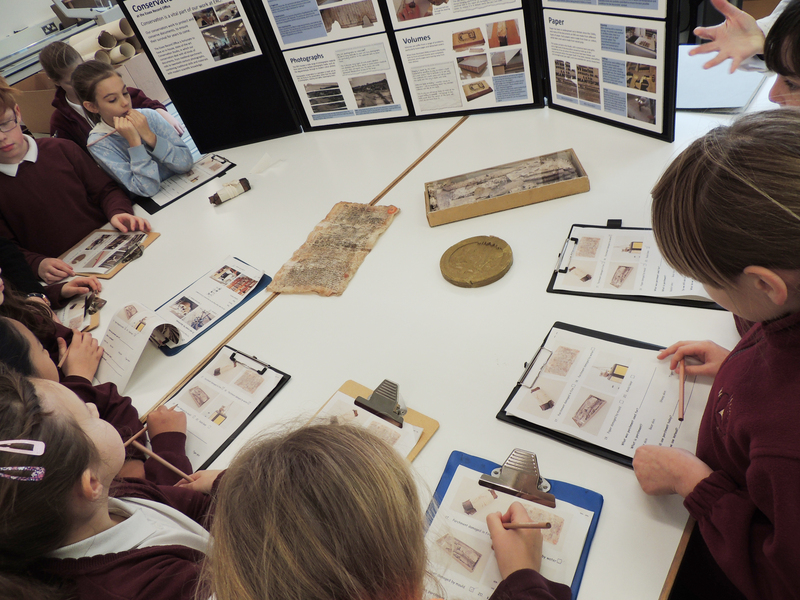 Hannah Salisbury, Access and Participation Officer at ERO and project Historian Claire Driver introduced the pupils to the wealth of material available from the collections and explained how to use a range of historical sources to find out what life was like during WWI. The children were able to ask questions about their former pupil and in some cases looked on Ancestry too. They focused on the two fascinating stories of the nurse Kate Luard and soldier Alf Webb using sound archives, letters and an interesting range of hands-on activities which even included bandaging at a WWI dressing station. Following on from the research, the pupils are now working with Creative Writer Baden Prince to creatively narrate in their own words each soldier’s individual story. They will then work with Photographer Georgia Metaxas to document their homes, making comparisons with then and now. Do you have any information to help our research? We Will Remember Them project has been made possible by the funding award from Heritage Lotter Fund’s First World War: then and now programme. Archivist Allyson Lewis takes a look at a battle of wills between a headmaster and his pupils in late-Victorian Purfleet. ‘Remember, remember the 5th of November, Gunpowder, treason and plot’ begins the rhyme. It commemorates the attempt in 1605 to blow up the Houses of Parliament by a group of conspirators led by Robert Catesby. The aim of the plot was to kill James I and replace him with a Catholic monarch. The group included Guy Fawkes who hid in the cellars of the Parliament building to guard the gunpowder and light the fuse as the King entered the building for the opening of the parliamentary session. He was arrested, tortured into giving up the names of his co-conspirators and duly hanged. The celebration of the preservation of the Protestant monarchy began almost immediately with the passing of the Observance of 5th November Act in January 1606. Although this was intended as a day of thanksgiving for the safety of the king, it became an excuse for anti-Catholic feeling, particularly after the future Charles I married Henrietta Maria of France, a Catholic princess, in 1625. Effigies of the pope and the devil were burned for the first time that year. 5th November Day was re-established as a celebration of Protestant monarchy after the restoration of Charles II. The landing at Weymouth of William of Orange on 5 November 1688 added another layer of Protestant significance to the day. During the 18th century it became more usual to burn effigies of Guy Fawkes rather than the pope. The Observance of 5th November Act was repealed in 1859 but the tradition of Bonfire Night still continues. In the 19th century children began a custom of ‘poping’, going from house to house begging ‘a penny for the Guy’ and gathering wood for a large bonfire. 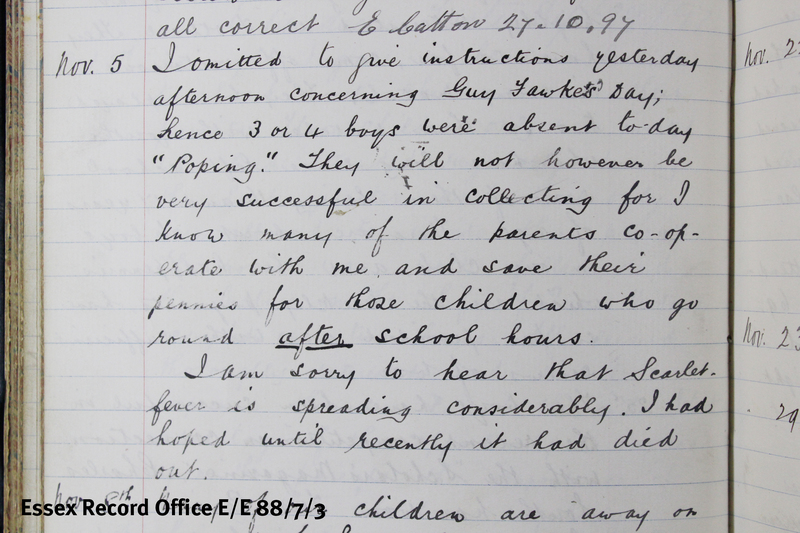 In this log book entry, the headmaster of Purfleet School comments on his attempts to prevent boys going ‘poping’ in school hours by encouraging residents to only give to children going round after school. He allowed the boys to bring their costumes into school and change in the school cloakrooms before going out begging for wood, food, drink and pennies, and singing traditional rhymes. The school log book will be on display in the Searchroom throughout November 2014.